Put together a bunch of green onions, a roaring fire made from vine clippings, a wicked sauce based broadly on almonds/hazelnuts/tomatoes/olive oil/garlic, and a large group of Catalans bent on having a good time and you have the makings of a calçotada. I'd been haunted by images of this classic Catalan midwinter onion feast ever since my (Catalan) son-in-law Jordi told me about it some time ago. This year I finally got a glimpse of what all the fuss is about. Of course a calçotada is much more than just an onion feast. It has Saturnalian/Bacchanalian elements for banishing the late-winter blues, it's an antidote to the excesses of Christmas and a last blast before the once-customary privations of Lent, and as the season advances (calçotadas happen any time between January and April), it becomes an early spring ritual that answers the body's craving for sharp, bitter flavours after the stodge and tedium of winter. Above all, it's the perfect excuse for Catalans to get their knees under the table with a (generally huge and boisterous) group of friends, tuck into some robust food, throw back some local wine and put the world to rights. 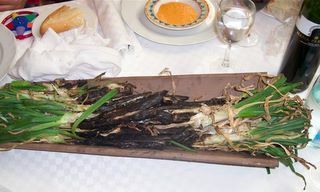 Just as the calçotada is no ordinary feast, so too the calçot is a special kind of vegetable - a sort of cross between a spring onion and a leek. To find out more about the secret life of the calçot I called up Raimón, a green-fingered friend of my son's who lives in Palafrugell where he raises a riot of organic veg. to sell through box schemes and at the town market. 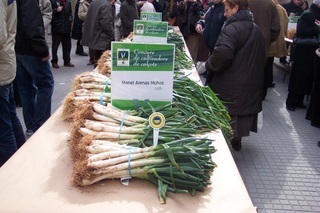 The real specialists, he says, produce calçots from seed. They get started in late winter or early spring, and the whole process takes about a year. First the little black onion seeds are scattered in a sheltered corner of the garden. Once they're a few centimetres high the seedlings are planted out in rows in the fertile, reddish sandy soil and left to grow on like regular onions. By midsummer they've done what onions generally do: they've formed a nice chubby bulb at the base. At this point they're pulled up and left in a cool dark place to dry out. Under ordinary circumstances this would be the end of the onion’s short life and it would be pressed into service for a Catalan sofregit (a delectably jammy concoction of onions, tomatoes and other vegetables) or a samfaina (a classic stew of aubergines, peppers and onions). 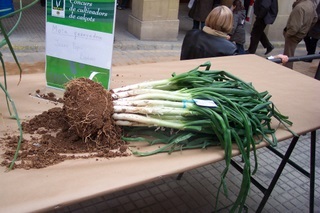 But - as we've seen - the calçot is no ordinary onion. At summer’s end, the tops of the bulbs are summarily sliced off and the onions are set in the earth again, not too deep and barely covered with soil. ‘They need to be able to hear the church bells ring!’ grins Raimón. Within a short time –about a week - they begin to sprout, 5 to 7 shoots from each decapitated onion bulb. As the shoots continue to grow, they're repeatedly earthed up with a protective ‘boot’ of soil (calzar in Spanish means ‘to put your boots on’, hence calçots). This has the effect of blanching, tenderizing and sweetening the onion shoots - think celery or white asparagus. From each sawn-off onion you get a prolific bunch of thin-stemmed, pale green, tender calçots which are ready to eat by year’s end. You can find calçotadas throughout Catalunya during the winter months, but the biggest and best known is the Festa de la Calçotada in the little town of Valls, the spiritual home and nerve centre of calçots which lies north of Tarragona and southwest of Barcelona, on the edge of the Penedés vineyards. It's here that the process of blanching onions was pioneered in 1896 by an enterprising market gardener named Xat de Benaiges. For about 50 years the calçot tradition remained a family one. Then in the 1940s a group of artists caught on and began to stage well-publicised calçot events for arty crowds in a number of venues and restaurants around Valls. The crowning recognition came when the Calçot de Valls gained its own IGP (Indicacion Geografica Protegida) in 2001, meaning that it must be grown in a certain delimited area around Valls and attain specific - and impressive - dimensions. For the Festa the streets of Valls are thronged with people, there's oompapa music and drumming, processions and floats. But at the heart of it all are the calçots. We threaded our way through the crowded streets to the Plaza del Blat (Wheat Square) where we found a scene reminiscent of the village produce show, as proud growers set their winning calçots on trestle tables for all to marvel at. Across the square groups of ladies in traditional costume pounded almonds, roasted tomatoes, garlic and olive oil to a smooth reddish-orange paste for the famous salsa per calçots and proffered samples on little crusts of bread. In the middle of the square over a patch of sand, a gorgeous bonfire was being built from vine clippings. Once alight, they quickly reached a fearsome temperature - we gathered round gratefully in the pale winter sun. From the sidelines a four-legged rectangular grill arrangement resembling a metal bed frame emerged, completely covered with the trimmed green onions, neatly laid in rows. The grill was set down over the furnace and a great cloud of smoke went up. In a few minutes the calçots were done on one side. The grill was lifted off by red-bonneted, white-shirted acolytes and the onions quickly turned, returned to the fire and left to complete the cooking. The butcher's shop on the square was doing a roaring trade in butifarra sausages and lamb cutlets. These would be grilled over the fire by seasoned festlers once the onions were done. In yet another square a group of lean and hungry-looking young men equipped with capacious bibs stood ready at a horseshoe arrangement of tables, facing the expectant crowd. 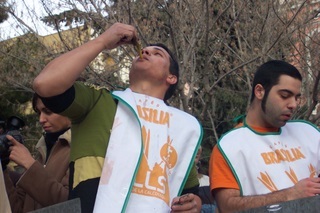 The Festa organiser grabbed the microphone and introduced the 16th Grand Competition of calçot-eating. At a given signal, the competition began to see who could woof down the greatest number of calçots (and sauce). They went about their task methodically and rhythmically, gripping the onion by its top, stripping off its charred and grill-blackened sheath, dipping it into the sauce, tipping back their heads and munching down the length of the onion. It was our turn for lunch too so we ducked into the nearest tavern, full of happy, shiny people all in festive mood. We donned our bibs and surgical gloves and awaited the feast. 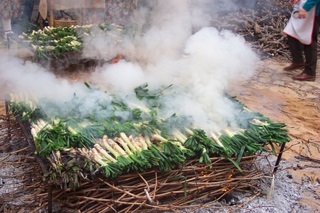 Soon a pile of blackened, frazzled calçots appeared, cradled in a curved roof tile which kept them warm. In time-honoured fashion we gripped the tops, stripped off the blackened bits, dunked them in the salsa per calçots, threw back our heads and chomped them down with gusto - though I have to admit that we only managed about a dozen each. Definitely not just any old onion festival, but a feast to remember, a heart-warming, enriching experience in all senses, and the perfect way to brighten the winter days. I'm already booked in for next year. Put the garlic cloves, tomatoes and chile on a griddle or heavy ungreased frying pan and heat steadily till the garlic is soft and the skin blotchy, the tomatoes burnt in patches and the chile slightly blistered. Set these to one side. Soak the bread in the vinegar. Put the almonds and the hazelnuts in a small baking tin and toast in a 200 C/400 F oven for 8-10 minutes or until the almonds are golden and the hazelnuts toasty and fragrant, and the husks can be rubbed off easily. Remove, allow to cool a little, then twizzle the hazelnuts between finger and thumb so that the husks rub off. Put almonds and hazelnuts in the blender and blend (dry) till finely ground. Quarter the tomatoes and slip the garlic cloves out of their skins. Add the tomatoes, garlic and chile to the blender and blend again till smooth. Through the hole in the funnel add the olive oil till the sauce emulsifies and turns a gorgeous pale orangey-red. Serve with calçots or with fish, chicken or pasta. Wonderful! Having grown onions from seed, and harvested them as "spring onions", I had no idea they would sprout again. Great idea. And surely the tradition of grilling "cebollines" with the carne asada comes from this tradition. Good work!